ADOPTED: I have found my forever home!! One that understands that beauty is only skin deep, they love me even with my deformities!! My new family understands the commitment needed and the love wanted!! I love my new family!! 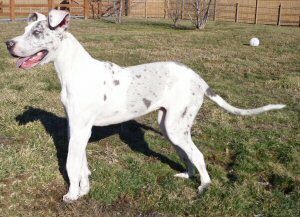 My owners got me from a backyard breeder and when they moved, they abandoned me leaving me to fend for myself. Now really how was I supposed to be able to fend for myself when I could barely walk???? I have Hypertrophic Osteodystrophy better known as HOD and have had it for months. My owners had not even bothered to get me medical care they just left me to suffer and die!! Luckily, the Humane Society came for me, unfortunately, they had no experience with my disease, but they reached out for help and within hours of hearing about me, I was at Harlequin Haven. Within hours of arriving at the rescue my pain was subsiding and my temperature was back to normal. I am on new medication, new dog food and already I am doing better. Grandma gave me a really soft bed and tons of toys but best of all she gives me tons of kisses!! She has told me that it will take time for me to get to feeling really good but HEY already I am feeling much better!!! The HOD has already stunted my growth and will leave me deformed but that is okay as long as I am not in pain! October 16: I wanted to let you know how I was doing plus that I have added new pictures to my page. Please scroll down and see my new pics!!! 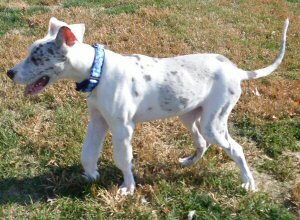 I now weigh 47.4 pounds so I have gained 3 pounds since I have been here at the rescue! Not bad for a week huh! I still have a lot of weight to gain but Grandma says not to worry about it that it will come when my body is ready. I really am not worried because I eat 4 meals a day plus treats so HEY life is great!!! I am in a lot less pain so I am going out more to play and get exercise too! Well gotta go it is time to go put and potty then eat lunch! October 24: Another week has passed and things just keep getting better!! I am playing more and more and becoming a real happy puppy! Hopefully I will get weighted today and maybe even a new picture or two! Well time to eat so will write more later!! October 31: Another great week!! I now weigh 52.8 pounds and am feeling great. I am even getting a bit taller!! If you scroll down you can see my new updated pictures!! I am running and playing with Dawn a sanctuary dog. We had lots of fun!!! I also am wearing a new collar that was a gift from Amy at Collar Me Happy, I look so beautiful!! Okay its my favorite time of day so I gotta run!!! Its dinner time!!! November 14: Sorry I have been playing and having a great time and I forgot to write my update! I am now off all medication and hopefully my HOD will not return, but only time will tell. 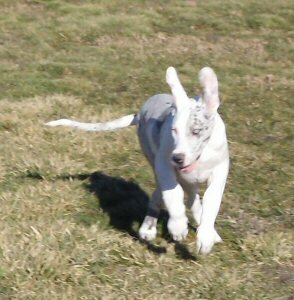 It feels great to be a puppy and be able to romp and play like other puppies! 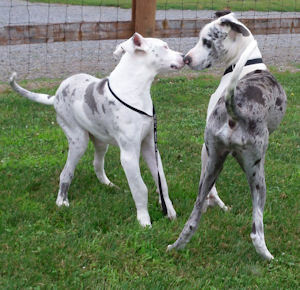 I just wish my legs were not so deformed so I could run as fast as the other dogs!!! Grandma promised me she would take me to see a orthopedic surgeon once she is sure I am over the HOD. Hopefully there is anything he can do to fix my legs. Update November 24: Great news!!! My HOD did not return so next week I will go and get spayed then my next step will be to see if there is anything realistically that can be done to fix my legs. I am so happy!!! Update December 5: I was spayed last week and had my legs checked by a surgeon and he does not think there is anything that can be done for my legs. He felt that they will straighten to some degree with proper care and food. Grandma and I are still planning to go see the orthopedic surgeon just so we have all the facts and can do what is best for me. I like being part of the decision making! BTW, I now weigh 70 pounds!!! I will try to get some new pics taken soon!!! Update December 19: Sorry I have not given any updates but it feels so good not to hurt and not to be taking any medicine that I have just been enjoying life!! I have my appointment on Tuesday to see the orthopedic surgeon and hopefully the weather cooperates and we will not have to cancel!! Then next Saturday some man called Santa Claus is coming and bringing all the good boys and girls new toys!! I can not wait!!! I know I have been a very good girl so hopefully he will bring me lots of new toys!! This is a very exciting week!! Update December 21: Sapphire went to see the Orthopedic Surgeon today and after x-rays and examination it was determined that she needs surgery on both of her rear legs ASAP. Her HOD was so severe that her rear legs are collapsing and without surgery she will need to be euthanized. 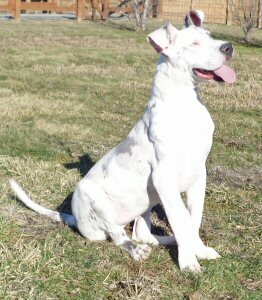 The Orthopedic Surgeon has never seen a case of HOD so severe and deforming that the dog has lived. He said that with surgery she will be able to live a normal life. 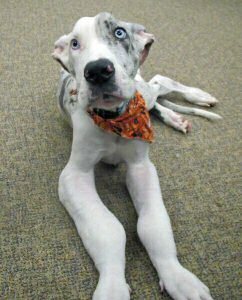 He did not feel surgery on her front legs would be of help. But by doing both rear legs it will help relieve the stress on her front legs. She needs surgery on her left rear leg first as it is the worst then the right would come in 8 weeks when the left leg is healed. Sapphire's surgeries will cost $2,200 each!! 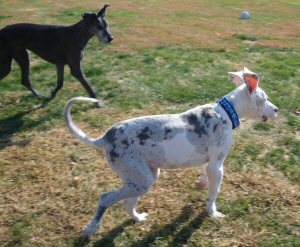 Sapphire has such will power and is so happy we can not bear to euthanize her. She only sees the good in life and she lives each day to the fullest. Sapphire has fought so hard to live please don't let her down now. She is one of the happiest dogs we have ever seen and just wants to give and receive love. Please help us to give Sapphire the gift of life this Holiday Season, the season of miracles and giving. 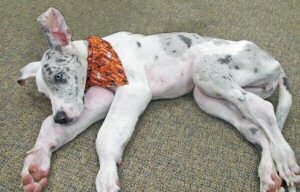 Update December 23: Sapphire has had her 1st surgery. As the old saying goes thank goodness for plastic. Since donations were so promising we decided to move forward and give Sapphire the surgery for Christmas. More updates to come later tonight. Update December 23: Sapphire is home and resting she will remain on crate rest for the 30 days. She has a recheck in 2 weeks and will probably schedule her next surgery at that point. Update December 26: I just wanted to share a couple of new pictures grandma took of me today with my new toys!!! She wanted to take a picture of my incision but I would not let her!! Scroll down to see my new pics! Update January 5: I went to see the Orthopedic Surgeon today and he said my leg was doing really well, of course I could have told him that! I have to go back in 4 weeks and have an x-ray of my leg to make sure it has healed properly and then maybe I can schedule my next surgery. Oh well I guess I can wait a bit longer! Updated January 26: Just thought I would give you a quick update!! I am counting the days till I return to the surgeon for my next check up, my appointment is on February 2nd! I am getting bored not being able to go play but Grandma keeps telling me it is all worth it but boy is it boring!!! Have you checked out the items that are selling on eBay to help pay for my next surgery? Okay time to chew on my nylabone some more!! Updated February 2: I went to see the Orthopedic Surgeon today and I have Great News to Share!! My leg has healed exactly as he had hoped and I can now have my 2nd surgery!! I did ask him 1 favor and that is that I have a brief wait between surgeries so I can run and play and he agreed!! So my surgery is scheduled for March 1st!!! I have almost a WHOLE month to run and play!!!! Now just for the weather to warm up so I can get outside and enjoy playing for a while!! Update February 18: Just wanted to give you all a quick update. First I want to thank everyone who has been bidding and buying the items on eBay to help pay for my next surgery. I also want to thank Becky for taking the time out of her busy schedule to post the items on eBay and all the other stuff that goes with it, which I know was a lot of work. Unfortunately all good things come to an end, and well the final straw came tonight!! A woman bid and won the beautiful Louise Peterson bronze pendant as soon as she won it, she emailed that she had bid on the item by mistake, then she said her five year son old bid on the item, then she said she would pay for the item, then she asked us to make a second chance offer for the item, which we did, but it was not accepted. Then she asked us to cancel the transaction because she had changed her mind, then she said she would have to take the money out of her son's piggy bank to pay for the item he bid on. Then she paid for the pendant and as soon as she received it, she filed a dispute. She said the item was not as described (not true, heck pictures don't lie only people do). Then she said the item was damaged. She even said that she had emailed us, which she had not! Needless to say I know that if we get the pendant back she will have damaged it so it will be worthless! The woman said she wanted to help me well PLEASE tell me how she has helped me??? She won't give me the money and now Grandma says we are finished with eBay! 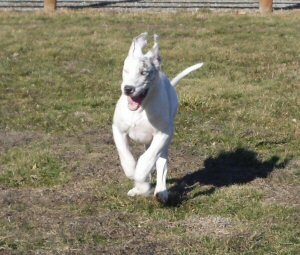 Grandma says she does not have the time or energy to deal with people like her when there are Danes like me that need her time and energy!!! Heck eBay doesn't even care about dogs, they now have a classified page where people and puppy mills can sell dogs, cats and other animals just like Craigslist!!! Ainsley and Landon told me all about that list and it is really scary!!! What has this world came to? Why do people abuse animals? Why do people lie? Why do people try to take away from poor homeless dogs??? I do want to thank all that are truly wonderful people who do care about me and my friends here at the rescue. Between your kind donations and the eBay sales that did pay I now am only $525 from having the money for my surgery! Grandma told me not to worry that things will work out, but hey I do worry!!! Well I need my beauty rest so I am heading to bed so I can run and play tomorrow. Only 11 more days till my next surgery!! Update February 20: I finally was able to get Grandma to take some new pictures of me!! Yesterday sure was a beautiful day!!! Update February 22: I want to thank you all so very much for your kind donations!! I now only need $350 now!!! Just think a week from today is my next surgery! Update February 24: Thank You so very much for the kind donations that continue to come in!! I now only need $150 for my surgery!!! 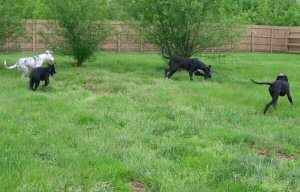 Hopefully the rain stops this weekend so I can get a few more laps in the yard before my surgery! I sure do love to run!! Update February 27: Thank You, Thank You, Thank You to all that made it possible for me to have my surgery Tuesday!! All my money has been raised and now I can concentrate on playing!! Thanks again!!!!! Added Picture below YEP still running!!!! 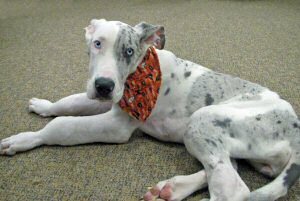 Updated March 1: Sapphire had her surgery today and is recovering and doing great. All went well and she should come home tomorrow. Thank you for all your support and prayers. Update March 2: Sapphire is home and resting. She again is on bed rest for 30 days and will have a recheck in 2 weeks. Update March 6: Sorry I have not written sooner but have just been resting trying to get healed so I can go play again!! I am doing okay just bored. I am counting the days till my next appointment!! Update March 13: I am healing nicely and wanting to start playing again so that is a good sign!! I am still on bed rest so it gets sorta boring but grandma keeps giving me new toys and stuff to keep me busy. My next appointment is scheduled for March 23. Of course not much will change then because I already know I will not be allowed to play then but hey each week gets me a bit closer to play time!! 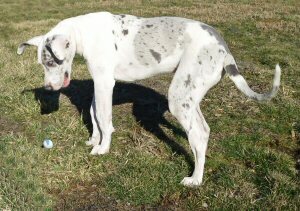 Updated March 17: Well grandma tried to take my picture today but I told her NO not unless I can go play in the yard!! Well you guessed it no picture and no playing!! Boy this bed rest stuff is getting boring!! Updated March 23: I went to see the orthopedic surgeon and he says I am healing great!! I will go back in 4 weeks and have x-rays taken and if all is okay I will we allowed to play!!! Update April 10: My next appointment has been scheduled for April 21st!! If all goes well which I am confident it will I will be released and available for adoption that following week!! Of course what I am really looking forward to his running and playing!!! Eleven days and counting!!!!!! Update April 24: Great News!!! I am NOW ready for adoption!!! Okay forever home where are you???? 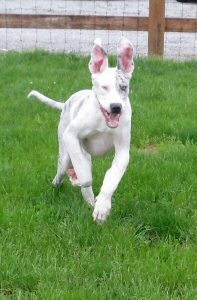 As soon as it stops raining Grandma promised me she would get a new picture of me running and being just happy!! Update May 16: Well guess you all have noticed the rain is not stopping this spring so since yesterday it was not storming I talked Grandma into taking some new pictures of me! Most turned out blurry because of how fast I run!! Scroll down to the bottom to see my new pictures! 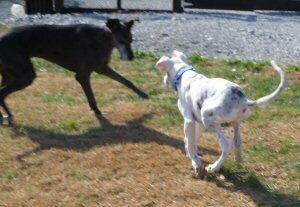 We (Kevin, Desiree and Destin) had a great time playing tag! BTW, I am still waiting on my forever home!!! Update June 12: Well it has been almost a month since my last update so I thought I would just let you all know what is happening! 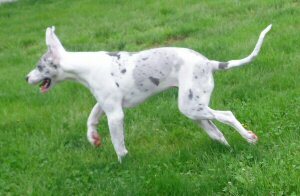 I was viewed by a potential adopter yesterday unfortunately I was not a good fit for their home because I am soooooo active and playful!! I just love to run, jump and play and well their little dog did not appreciate all my energy!! Gotta go and play now!! 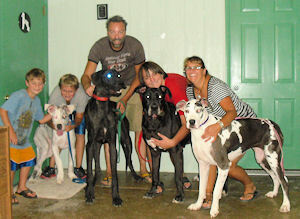 Update June 18: Grandma had told me a Dane believed to be my brother Trey was here but I did not believe her! Well today I got to see him! Scroll down to see the picture of our reunion! Pictures above compliments of the Humane Society of Greater Akron.